How to Decorate Glazed Ceramics. Turning something ordinary into something special with your own hands is a rewarding way to decorate your home or make gifts for others. 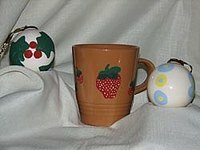 A simple coat of paint can do wonders for a plain ceramic mug or an unadorned porcelain ornament. Though these surfaces require a bit of special attention, once you know how to treat them you can get great results. Several companies make paints especially for ceramics so look for these first. Most glass paints will also work on glazed surfaces. If want to use a color that is not part of the ceramic paint line, look for a surface additive that can be added to any acrylic paint. Remove any hardware from your items such as metal ornament hangers, plastic tags, stickers or decals. Clean the area to be painted with a cotton pad dipped in rubbing alcohol. This will remove the dirt and surface oils so be careful not to add any back by touching that area as you work. Paint your designs lightly. Two thin coats are always better than one thick one. Clean up any stray marks with a cotton swab dipped in alcohol. One way to cure the paint is to let the items dry for 21 days without being disturbed. Another (quicker) option is to let the paint dry for 1 hour and then place the items in a cold oven and turn it on to 350 degrees Fahrenheit. Let it come to temperature (about 5 to 10 minutes) and then bake it for 30 minutes. Turn off the oven and let everything cool before removing the painted ceramic. Replace any hardware you took off in Step 1 and you're finished! The mug had no extra parts but I needed to remove the hangers from the ornaments before I got started. The alcohol evaporates and leaves behind no residue, unlike soaps and other cleaners. I've painted my designs freehand but you can use stencils or foam stamps as well. Cleaning up the paint while it's still wet is a lot easier than after it's dried. Curing allows the paints to harden and adhere completely to the surface of your piece. Staring the ceramic in a cold oven reduces the risk of breakage due to rapid temperature change. All finished and ready for gift-giving. In order to give the ceramic enough time to cool, you may want to do the oven curing in the evening so they have overnight to come down to room temperature. You may want to seal items that will not come in contact with food but would otherwise receive hard use (like tile coasters). Never paint the rim of mugs or stemware or any surfaces that will come in contact with food.